Please complete the entry form below to enter this giveaway. You need to be a member of Ebates in order to enter this giveaway. I will verify that the winner is an Ebates member before making the winner’s announcement, so please use the email address that you use for your Ebates account. 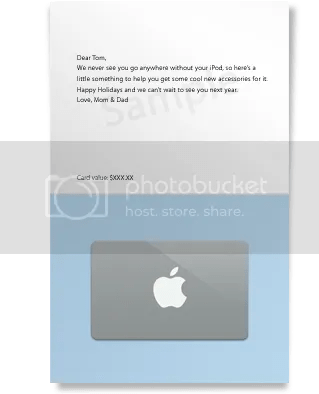 The winner will receive a $300 Apple gift card from Freebies 4 Mom by mail that can be used either online or in an Apple store. This giveaway closes at 11:59 pm Sunday, March 21. If you have any problems filling out this form, please email me with the subject “Apple Giveaway”, your first and last name, and tell me the email address you use for Ebates. Thanks for entering and come back after Sunday, March 21 to find out who won. would love to win this Apple! & could use it so much for education! 🙂 Good luck everyone! Hey..I almost missed this one..I have my fingers crossed as I want an iPod so bad…hopefully I am finally lucky enough to win. I have just discovered you in the last few weeks and I Love this place. Thanks. What a generous giveaway! Who wouldn't love $300 to the apple store! great give-a-way!! I am a member of ebates! except I am signed up under a different email address than this account will take you to. andrewandkelly (at) live (dot) com. i don't know how Ill be able to sleep!! Fantastic giveaway!! Okay so I hope I am entering this in right, I thought I did the other day. Well I would LOVE to win this I LOVE APPLE! I just signed up for ebates and can't wait to start using it! I am not able to get to the Ebates site to join? What am I doing wrong? I just found freebies for mom a couble of weeks ago. I never would have known about ebates or swagbucks, or many others. Thank you for all you are doing! Thanks, just signed up. Hope I win!! nice giveaway. I just joined ebates through your link! I really hope I win… My husband is buying the iPad and I am freaking out about the fact that it is $800… that would make me chill a little bit! Thank you for all these opportunities!!! Thanks ~ I had no idea this site existed & just signed up for Ebates!! You are so good to do these so often! I'd love to win this! I don't have an ipod, but I would certainly love one!! I would love to win this. I love Apple!! This is a great giveaway. I really could use an ipod..thank you! Thank you for all the awesome giveaways. I have my fingers crossed that I win this one. I'd love to get an iPod Touch (the pixels on my four year old iPod are dying). AWESOME Giveaway and a BIG Thank You for all that you do on your site to help those of us who a trying to stretch/save money. Thank you for the opportunity! I had to look twice since it said the deadline was FEBRUARY 28th. Then I realized you meant March….Have a great week! Great giveaway!! And my ipod just died. Thank you for the chance!! You are really selfless for doing this, ESP so many times! I would wanna keep it all to myself! Thank you so much 🙂 crossing my fingers that this will be my lucky time!